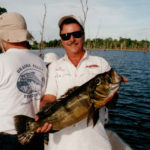 Lake Fork Fishing Report December 2000 by: Guide – Sherry D. Ruslink December rings in Christmas, closure for the year 2000, and GREAT fishing on the Fork! This is the month to hint to Santa Claus for fishing equipment that you have drooled about all year. Make a wish list and leave it in a convenient place that it will be noticed! Fishing and hunting related items are great to give as gifts for that hard to buy for person in your life. Often times you will receive something that you would not ordinarily buy for yourself. Many small items are available and make wonderful stocking stuffers. 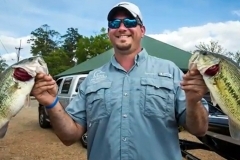 Gift certificates are always welcomed by anglers and hunters, because they can then purchase something that has been on their wish list for a while. For the extra special gift to a loved one, consider a fishing or hunting guide trip to a place they have longed to visit. Many outfitters offer numerous travelling packages that can be put together, whether it is staying local or travelling abroad. The internet is a fantastic way to investigate fishing and hunting opportunities for anglers and hunters, so get out the old keyboard and log in to find that unusual or different gift for the outdoors person in your life. Merry Christmas and a Blessed New Year to all! This is the time to be on Lake Fork! Football is coming to a close; hunters are out stalking their prey; families are shopping; and many are just staying in away from the cold weather, and the lake is almost empty! No pressure, no competition, no hot weather! Just you, the great outdoors, the bass, and Lake Fork! What more could an angler want, . . . well maybe a double digit bass would fill the bill! It can be accomplished on Fork in December, January, and February. In previous years, many of the large bass were caught in the colder months! 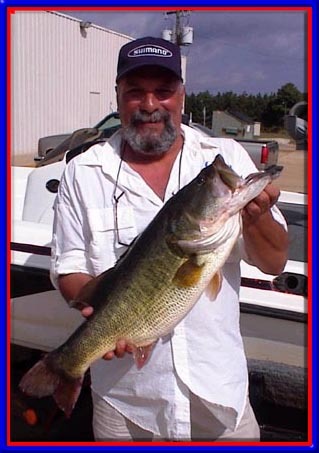 So, get the boat out, and come enjoy east Texas and the famous Lake Fork trophy bass lake situated in northeast Texas. 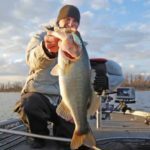 It offers year round fishing, boating, and camping with seasonal attractions as an added plus such as crappie fishing, duck hunting, hog hunting, deer hunting, golf, antiques, and county festivals. As long as the water temps hover around the mid 50’s, bass will remain in a feeding mode trying to take advantage of unsuspecting shad that swim aimlessly in and out of creeks. The bass will follow shad to the backs of creeks and gorge while they have them trapped, and then swim back out a ways to follow some more shad to the back of the creek again. Bass are cold blooded animals and must feed heavily to acquire enough protein to sustain their systems through the winter. Watch for shad busting the water, and notice which way they are travelling. 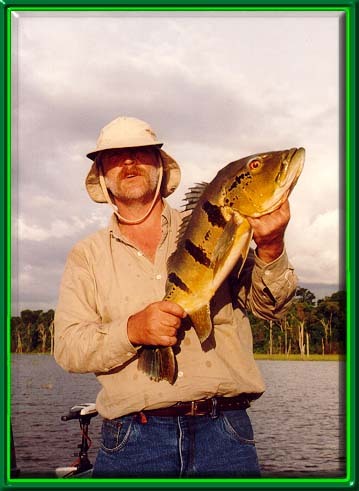 Cast in behind the group of preyfish with a lipless, shad color crankbait and start winding back at a pretty fast pace. Because the bass are giving chase to feed on the shad, this lure will fool the bass into a strike just about every time. When the water temps fall to lower 50’s and below, bass will move into a winter pattern in deeper haunts and suspend. An “S” bend in a creek channel toward the back of a cove is a good place to look for bass. Deep drop offs such as ledges, submerged roadbeds, submerged bridges, and pond dams are real good fish holding structure during the winter. Lures that are productive around these deeper areas is a jigging spoon or Chuck N Spin, large shad colored spinnerbait, jig/pig, Gene Larew Hawg Craw using a large sinker and hook, and a Carolina rigged Gene Larew Salt Fry or the Bass Assassin Fry Assassin in watermelon, junebug, pumpkin, or red shad, using a 3 feet leader on the Kistler Carolina Rig Rod is going to be the “go to” rig of choice. 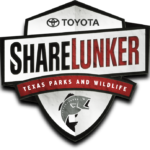 As of September 1, 2000, there is a new largemouth bass slot limit that is enforced on Lake Fork by the Texas Parks and Wildlife which is 16″ – 24″. 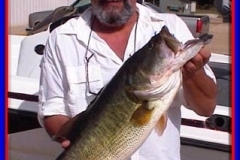 All bass which measure between 16 and 24 inches must be returned to the waters of Lake Fork immediately. 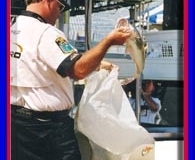 There is a daily bag limit of 5 bass, which 5 under 16 inches, or 4 under 16 inches and one over 24 inches may be retained per day. 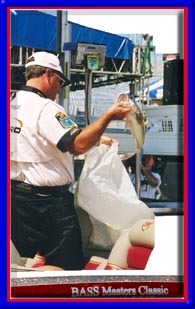 Please practice “Catch and Release”, “Safe Handling” of all bass, and be courteous on the lake. 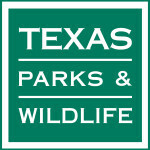 Texas Parks & Wildlife info, call 1-800-792-1112. Computer generated license, 1-800-895-4248, Visa and MasterCard only. Another good Christmas or Birthday present is the new Martin’s Map or CD Rom which will enable the angler to find many structures that Lake Fork has to offer for bass habitat. The new CD Rom is a must have for the anglers that frequent Lake Fork. With the aid of a computer, you are able to zoom in or out on contour lines, structure, see pictures before the lake was filled, receive fishing info from myself and Kerry Stafford, as well as print off the information that you want. Every angler that fishes Lake Fork ought to have this new CD Rom. Call me for details on retail or wholesale, and mail order purchases. Sherry Ruslink is a licensed guide on Lake Fork. She runs a full service Bass Fishing Guide Business. Sherry’s guide service offers individual, corporate/ group, instructional, and tournament prefish trips. Day trips, night trips, and Â½ day bass fishing trips, Crappie trips, and gift certificates. 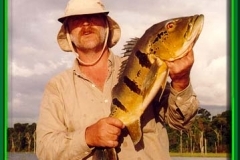 Duck hunts, catfish trips, and full package fishing and / or hunting trips to Lake Guerro, Mexico can be arranged. Sherry can be reached at 903-383-7310, 1-877-523-9227, email: ladybass@koyote.com, URL: http://www.texs.com/ladybass/fork.htm. 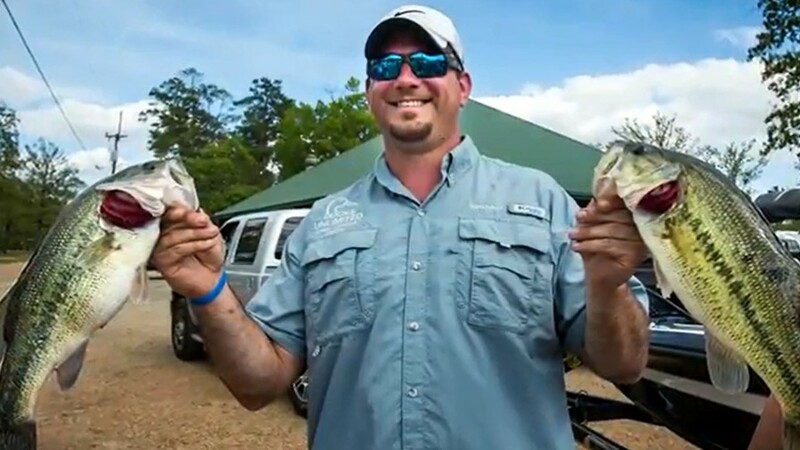 Sponsor’s include – Triton Boats/Mercury Motors, Kistler Rods, Shimano Reels, Lowrance, Motorguide, Lockhart Lures, Gene Larew Lures, Top Brass Tackle, and Bass Assassin. Thank you to all my clients, friends, sponsors, and family for the support and love that you have shown me for many years! Merry Christmas and a very Happy New Year to all!